Madison, WI TAA organizes mass occupation of Bascom Hall | Fight Back! Madison, WI - On April 5, graduate workers at the University of Wisconsin-Madison occupied Bascom Hall for three hours, organized by the Teaching Assistants Association (TAA). The primary demands were that segregated fees be waived for graduate workers, that the international student fee also be waived, and that the university respect the collective bargaining process. 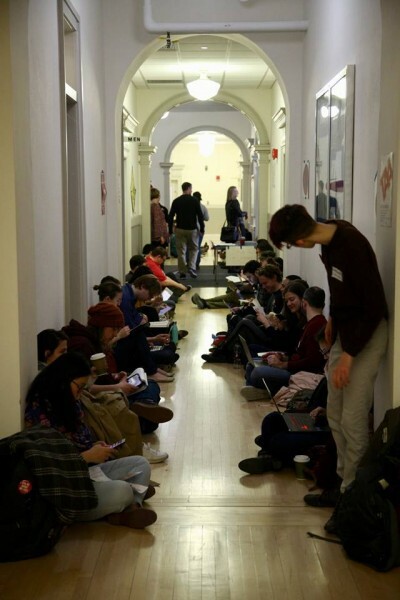 Over 400 graduate workers and supporters, including undergraduates, the faculty and staff union, and community members, turned out in the TAA’s largest action in roughly a decade. For graduate workers, for whom a typical yearly income from the University is about $13,500, segregated fees constitute an enormous tax on earnings, coming to over $1200 per year. These fees are ostensibly used to fund student services, but what graduate workers produce greatly exceeds this sum; graduate workers do the vast majority of teaching labor at the university, and the institution rakes in over half a billion dollars in tuition alone every year. Even factoring in the free tuition that many graduate workers receive, graduate workers are highly-skilled and hyper-exploited, and the remission of fees would only be the first step in moving towards adequate compensation. The executive compensation of the UW’s top 20 highest-paid employees, many of whom were offered raises of nearly 30% by the Board of Regents the very same day of the sit-in, greatly exceeds the amount needed to waive segregated fees if added together. By contrast, the raise for all UW system workers was a miserable 3%, barely keeping pace with rising inflation. The international student fee, though smaller in amount, is even more loathsome, constituting an explicitly racist tax on international students for no purpose. The TAA and its allies previously beat back a similar such tax which was passed by the racist Bush II administration, as its proceeds were used to surveil students. This second iteration of the fee has a nominally more humane purpose of ‘aiding’ international students, but it is a tax levied specifically on international students for a service that is provided free to domestic students - and therefore racist and unconscionable. Rounding out the list of demands was the achievement a fair graduate worker handbook. After the disgraced far-right ex-Governor Scott Walker rammed through Act 10 in 2011, UW-Madison graduate workers’ union contract was nullified, along with the contracts of many other public-sector workers. Since 2017, graduate workers and the administration have haggled over terms in what is known as the Graduate Assistant Policies and Procedures process, which should (theoretically) produce a handbook to replace the previous contract. Despite the fact that this handbook is merely a set of guidelines, which the university can choose to violate at will with no legal repercussions, administrators have nevertheless endlessly pushed back deadlines while failing to carry out what should have been a simple process. The TAA voted April 10 to endorse an exploratory strike committee at its well-attended April membership meeting. Graduate workers, like education workers across the country, are on the march, whether or not the capitalist state recognizes their right to form trade unions or not. The Teaching Assistants Association, founded in 1966, is the oldest graduate worker union in the United States. Its volunteer leadership - the executive board - is elected each year by the 500-plus membership. The TAA stands in the best tradition of the fighting workers’ movement and in solidarity with workers all over the world.